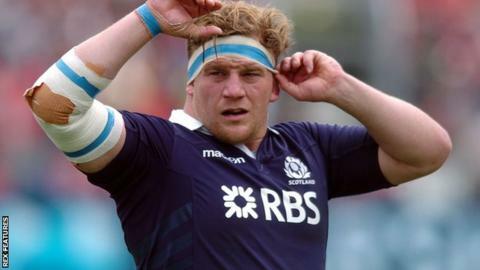 Moray Low says he wants to put himself in the "shop window" for Scotland by performing well for Exeter. The 30-year-old prop missed out on a place at this summer's World Cup having last featured for his country in 2014. "If you perform well for your club week-in, week-out then you're putting yourself in that shop window," he said. "For me it's just about performing well at the Chiefs. I had the chance last week to start and I've got the chance this week to go out and do it again." Low made his first start of the season in last week's European Champions Cup win over Bordeaux, having missed the tail end of last season with a hamstring injury. But he knows it will not be easy to stake a claim in a front row that boasts a number of impressive players, including Welsh international Tomas Francis, Carl Rimmer and Ben Moon. "I got the opportunity to play last week and hopefully I'll get another chance this week, so it's about putting in the performances and backing it up and getting the consistency," Low told BBC Sport. "We have a very big squad and we have a lot of depth in various positrons including the front row. "If you're not performing well the next person is ready to go so I want to go out there and perform well and keep the jersey."